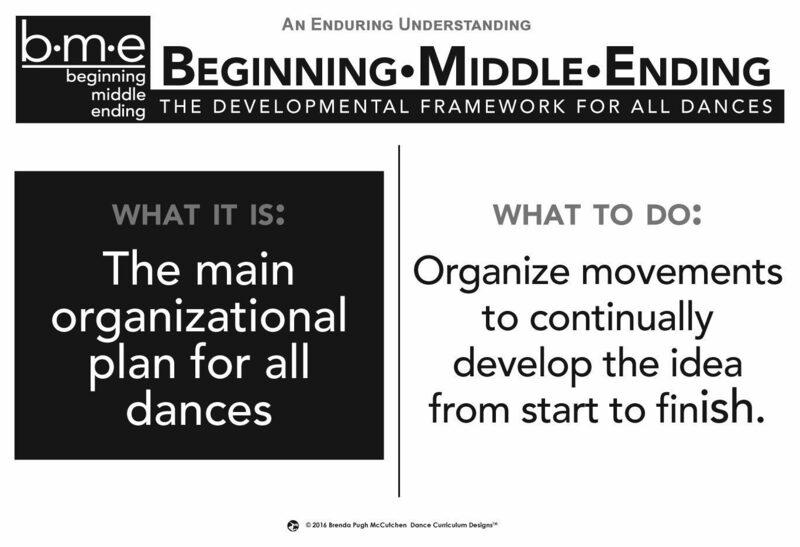 The Beginning-Middle-Ending (B-M-E) poster is a 13” x 19” black and white two-sided poster printed on heavy cardstock. 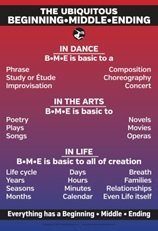 Use B-M-E to remind students of the importance of the B-M-E framework. A unified B-M-E is the essential underpinning of all choreographic forms and structures and is universal to other forms of expression such as poetry and music. Use both sides of this poster to emphasize the connection of each part of a dance in conveying the whole intent of the dance and its motivating idea. Side one explains the concept and how it shapes all types of dance to coherently organize the piece from start to finish. Side two contains teaching prompts to help students thoughtfully develop their intent while prompting them to move each composition forward.